The Mercedes-Benz 190E 2.3-16V was the first salvo fired from the cannons at Stuttgart in its luxury sedan wars with Munich. BMW's E30 generation M3 was actually second to market with a 2.3 liter high revving motorsports engine pushing out around 190 horsepower mated to a dog-leg 5-speed. For some reason the E30s are worth their weight in gold these days, but the 190E is still budget friendly...fine by me. Find this 1985 Mercedes-Benz 190E 2.3-16V Cosworth here on eBay offered for $9,850 buy-it-now or make-offer, located in Elkton, FL. The W201 Mercedes-Benz "190" sedan was built from 1982 to 1993 and is the spiritual ancestor to today's C-class sedan. It was an elegant but simple sedan powered by a spattering 4 & 6 cylinder gas and diesel engines. The 2.3-16V Cosworth edition turned up the fun to 11 with a powerful engine, 5-speed manual, big brakes, quicker steering ratio (on the non rack-and-pinion setup), and a limited slip differential. The heart of the 2.3-16V Cosworth transformation from Taxicab to Ringtaxi is a 2.3 liter DOHC inline 4 with cylinder head designed by Cosworth in Great Britain. The engine in Euro spec (like this one) puts out 185 horsepower and 174 ft-lbs of torque and mated to the 5 speed transmission. The 2.3-16V today brings with it more of an experience, than actual performance, with its strange dog-leg gearbox (1st gear is up and to the left, 2nd also up and 3rd just under 2nd - it was intended to allow 2nd-3rd gear changes on a race track to be quicker...but actually just confuses drivers). James May can't figure it out, but we have more faith in our readers. 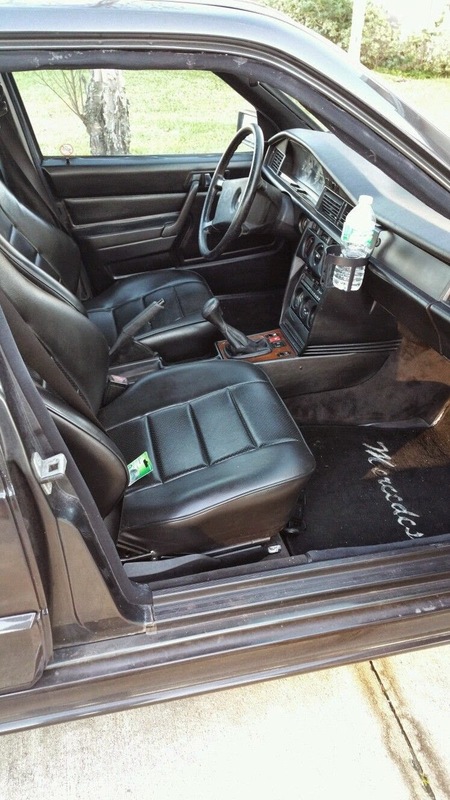 The Mercedes-Benz interiors from the 1980s are known to survive abuse well, with the exception of the steering wheel which after a few years of use seems to resemble the swollen & pockmarked surface of a drunk's nose. This one will also need some work on the door cards, but it won't be bad with some sorting and a new wheel cover. Neat car, even though I don't like MBs (horrific upkeep costs) I'd still like to own one of these some day. Maybe. It's a collectible that will never be worth big bucks. Senna had one, so why not us mortals? It's not really a spiritual successor to the C-class...it occupied a budget niche that is now occupied by the C class, but the design goal was to make a compact-sized car that would be indistinguishable from the S class from the inside in driving experience...including heavy steering, bank-vault-solid doors, and all the fancy doodads. They spent over 600 million engineering it, and later said they'd overdone it. That's why these were taxicabs--like an even more upscale Town Car, they just run forever with the exception of the climate control panel and the cruise control amplifier. Couple fun facts--as late as 1993, central door (trunk, fuel filler) locking was still done via vacuum hoses and a pump beneath the rear seat. The dash lighting wasn't lighted gauges, but a daylight color-temperature hidden bulb set illuminating the entire cluster so you would see it the same way you saw the instruments when it was light outside. Automatic temperature-wheel climate control, discrete audio packaging (tweeters in the dash, woofers in the front doors, active crossover somewhere). Word has it that the manual transmissions for at least the regular 2.6 are pretty terrible-feeling. Owning the boring 2.3 (8V) with an autobox, can't speak to that, but if you're prepared to do regular valve adjustments on this and understand that it's for performance, not cruising...hell of a driveway ornament. Just prepare to get dwarfed by the Fit down the street. These are SMALL cars. I'm 6'6 and on the latest 1,100 mile drive in order to keep my neck unbent I was far enough back to hang my arm out the rear window in comfort. Rear passenger legroom is best reserved for toddlers or Richard Hammond. I drove one of these (US Spec) a few years ago before the prices started slowly rising... I was underwhelmed even at the bargain prices of the early 00's and ended up with an E36 M3 instead. I sometimes wish I'd gone with the Merc instead. Minor typo: First on a dogleg gearbox is down and to the left. Reverse is up and to the left. Ah the Mercedes-Benz 190E 2.3-16V Cosworth otherwise known as "Not and M3"
If you've ever driven one of these (I own one), you'll know that James May's stunt on Top Gear was just that. There's no way you could accidentally engage reverse--you have to lift the shifter to overcome the lockout. The more common problem is downshifting, at least if you're skipping a gear. For instance, slowing from 4th and engaging 2nd for a tight turn--at first you have to consciously think about it. Occasionally I still get mixed up when jumping between my 16v and my 1998 Volvo S70 T5 with it's conventional shift pattern. I learned to drive in one of these, always a fan! Granted, ours was a White 87 190 (not E, it had the Carb engine). Only options on the car were electric front windows, underbody protection (Cairo streets have crazy potholes) & heavy duty suspension (again, those potholes). Didn't even have the 5th gear option - something my dad always planned on changing but never got around to doing it. We installed the infamous becker radio & AC shortly after we got it. Parents sold it in 2000, mere months after I got my license, with 63,000 miles on the clock. Car was impeccable. My parents took great care of it and never spared an expense. I was so sad to see it go. Steering wheel was perfect btw, everyone would ask if we'd changed the steering wheel & no one believed it was the original one. I second every word Anonymous said about the car's interior, it was like a vault in there.